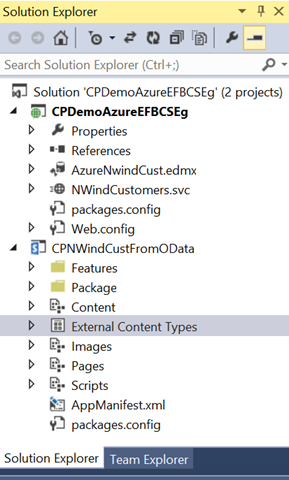 So yesterday, I was talking with Ted Pattison as he did a Critical Path class on the Great SharePoint Adventure (GSA) and a question was asked by one of his students about using Entity Framework to connect to a Oracle Database and then make an External Content Type and External List. 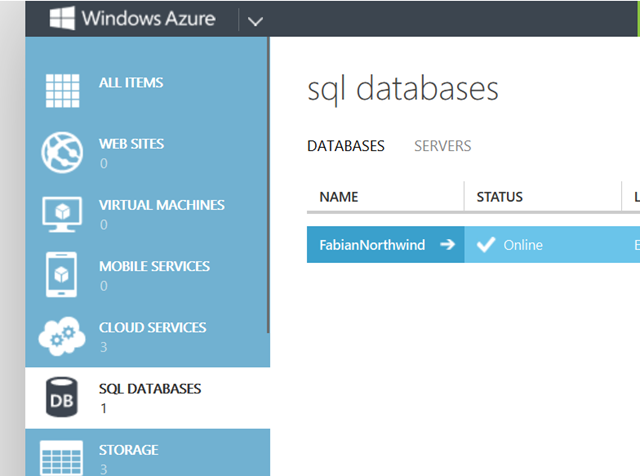 I suggested that you can use various Database Technologies to connect to your backend Data and serve it up. 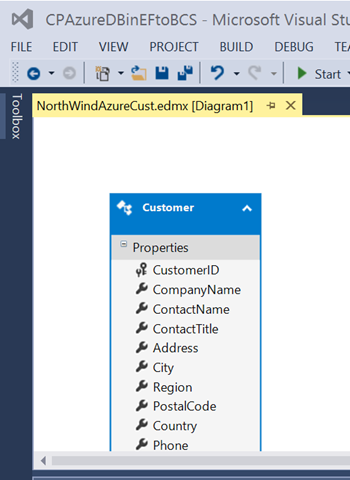 in this case I am connecting to a SQL Azure Data in this case Northwind Customers and I will be using ADO.NET Entity Framework to work with it. 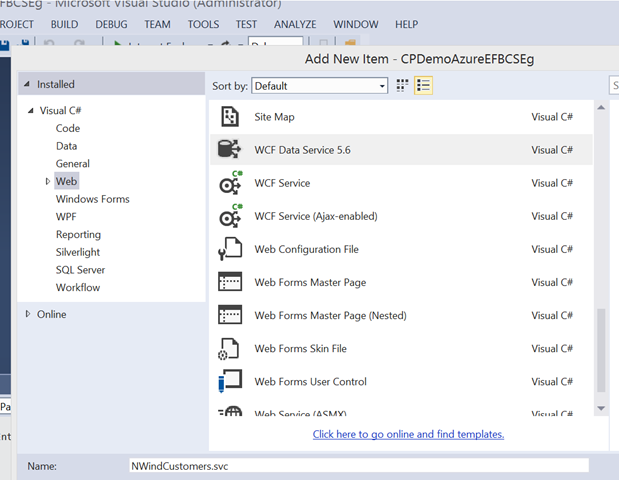 I will then use WCF Data Service to render this data into OData format and use that URI as a source for my External Content Type in a Visual Studio SharePoint App. 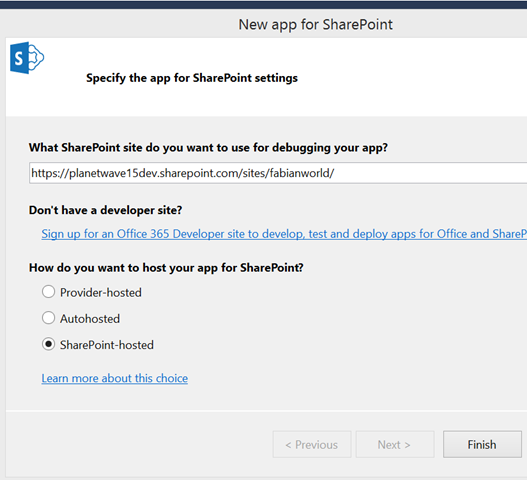 In all of this I will be targeting a SharePoint Online Instance, but this can be used for On Prem, in fact the way i do my example I would either need to have (1) set up my SPO for Hybrid Inbound or it wouldn’t work because my URI is internally hosted, I could of course (2) do a Azure Cloud Service [as i have done in previous posts] as well. 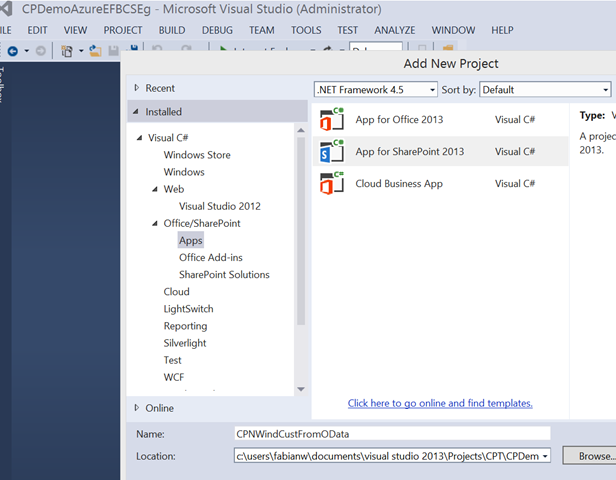 For this you will need a Visual Studio Solution with two projects. 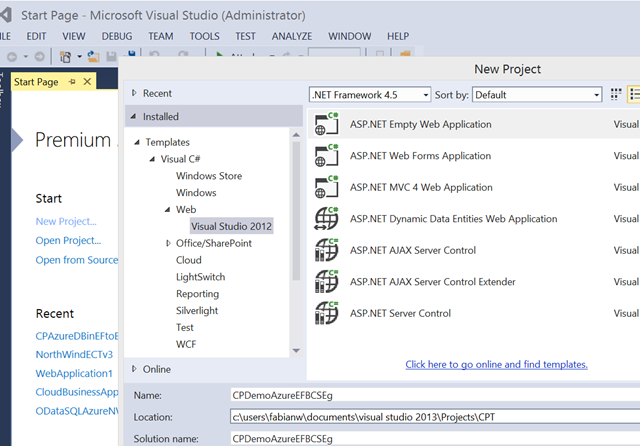 One will be for the ASP.NET project that will make the connection to the SQL Azure Data and host it, alternatively this could be a Web Role Project targeting a Cloud Service in Azure. 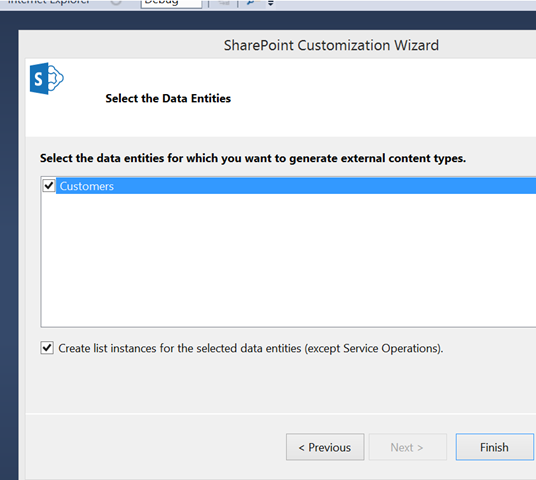 The second project will be a SharePoint App Model Project that will create the External Content Type. 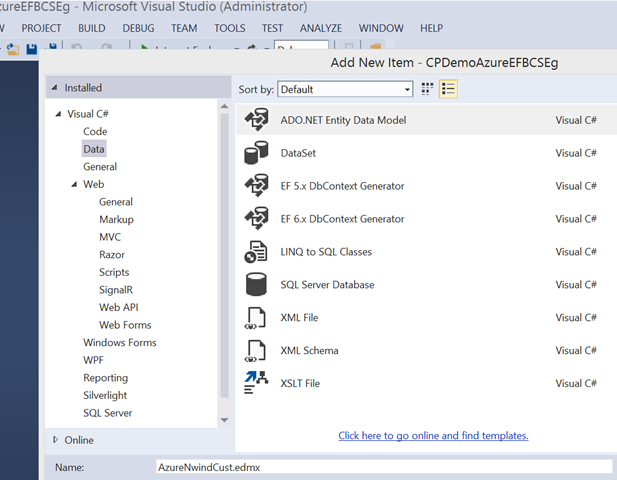 Above what you see is us adding a ADO.NET Entity Model to the project to connect to the Azure SQL Instance. 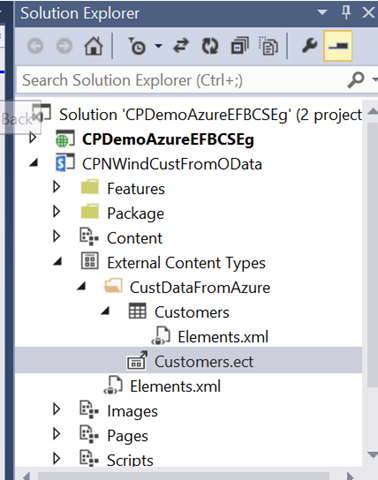 Save your project here and next we will have to add a WCF Data Service, we do this so we can have a URI to connect to that will expose the SQL Azure Data, or Oracle Data etc. 3: //     Copyright (c) Microsoft Corporation. All rights reserved. 18:         // This method is called only once to initialize service-wide policies. 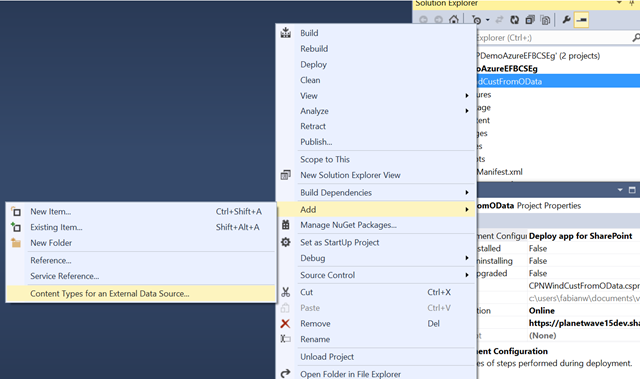 21:             // TODO: set rules to indicate which entity sets and service operations are visible, updatable, etc. As this is Demoware, I am going to use an (*) for the configuration and tell it to do “ALL” but you can be more discrete. 5:         // This method is called only once to initialize service-wide policies. 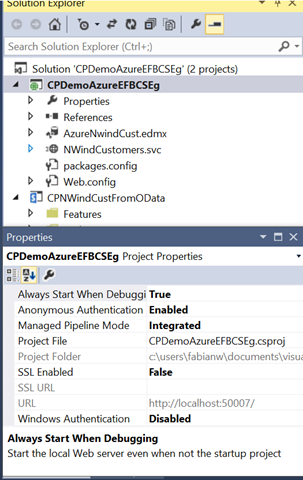 8:             // TODO: set rules to indicate which entity sets and service operations are visible, updatable, etc. 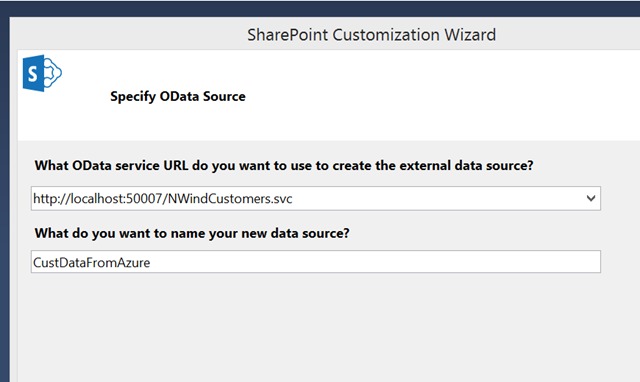 by typing in Customers in the URI, you will get an OData result set coming back to you. Pay attention to this URI you will need it for your next project. Ok, add a new project to your solution as i have below. Follow through on the wizard till your project is added. You provide the URI we have from the first project. 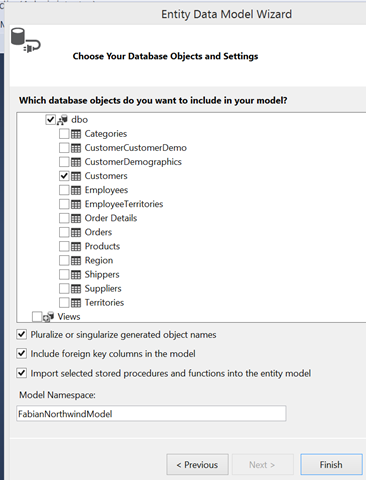 You select your Table, and leave the “check mark” for creating the List Instance so you will get your External Content Type and External List. I hope this is helpful, it was rather rushed, but i promised it in a few hours turnaround. 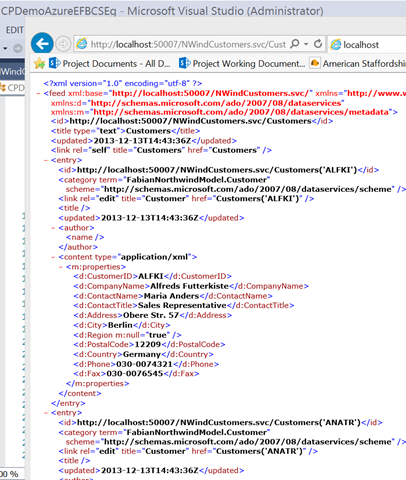 How to access the store procedure using ADO.Net entity framework and create a list using same service. 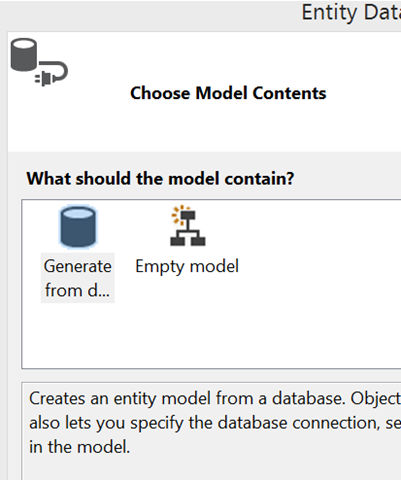 It does not create entity and Create list for the Stored Procedure. You can, if you create your Stored Proc to do what is necessary for CRUD methods just call them in SPD (for example) and individually create your Sterotyped methods. For instance, your Read list can be a stored proc that just does a select statement, your Read Item will be a Stored Proc that takes a parameter of ID and returns a single item etc.